Have you ever been in need? Maybe you have; maybe you have not. Maybe you feel compassion for the need y in your community. Perhaps you believe that the homeless deserve their fate. No matter what you feel or believe about the homeless, they are always there; sitting on your local downtown street bench as you leave a chic new lunch spot. They huddle together on a cold night as you leave your local coffee shop. They walk past you almost every day as you drive to your local library. They ask for a beer in your favorite bar on a hazy night. They sit next to your child as he or she learns basic algebra. The needy and homeless are always among us, and so are our attitudes about people less fortunate. “Hey, how’s it going?” I ask after leaving a popular downtown bar. My 6’2” husband looked over quizzically as he ordered pizza from a take-out window. “Good,” he says looking surprised. Why would a 20-something married woman be talking to a man sitting on a bench wearing a Packers vs. Patriots Super Bowl XXXI truckers’ hat? I wasn’t interested in talking about football. “So, let me ask you something: Do you have a place to stay tonight?” I ask without worrying about the young man passing by who apparently has never seen a homeless person. “Can’t stay anywhere unless it’s under 45 degrees,” he laments “What’s your name?” I ask. “Tom,” he replies, smiling. 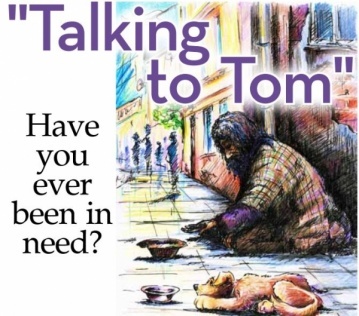 “What do you need, Tom?” I ask, knowing he needed more than I could possibly give. “A cold beer would be great,” he laughed. “How about a slice of pizza?” I ask as my husband walked over with a suspicious grin. It was getting late, and I asked Tom again, “Do you want a piece of pizza?” He gratefully accepted and retreated to his bench. I turned as I walked to my heated car and wondered how many times I had passed Tom before our encounter. They are always among us. The homeless are in restaurants, popular shopping venues, and even local schools. Why ignore them? Some believe if they ignore any problem, it will no longer be a problem. Does giving a homeless person a slice of pizza fix an issue that faces many local cities? Giving food is not a fix to homelessness. Realizing that homeless will always be there is a fix to our attitudes about those with less than us. We have all heard the old adage, “It’s all about attitude.” What’s yours? Put the Brakes on Cell Phone AddictionAsk Dr. HappyWhat’s the latest in greener booze? Are there any good organic beers, wines or liquors out there?